Rats and mice have a long history of spreading serious disease. One rodent sighting can scare away your customers for good. Rodents can contaminate and destroy your valuable food inventory, as well as cause costly structural damage to your premises by their gnawing and burrowing. A thorough rodent protection program begins on the outside. Our exterior rodent bait station program combats rodents before they enter your facility. State of the art “multi-catch” interior rodent equipment is strategically placed for optimal effectiveness. 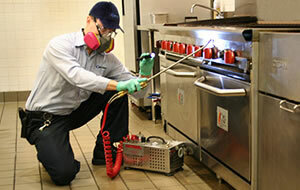 Preventing rodents from entering your facility is a key component in an effective rodent protection program. Matrix spends quality time inspecting all areas of your facility to identify possible rodent entry points. Where most companies fail in addressing rodent infestation is that they don’t spend the necessary time and repeat visits to ensure complete eradication.